Fresh Tracks Transportation provides shuttle service to the Outlets at Silverthorne from Vail & Breckenridge. Please see our rates & schedules below for additional trip information. The Outlet Shopping Express Shuttle runs on demand in the Spring, Summer & Fall. If you’re interested in using the Outlet Express Shuttle, please contact us at 97O-453-7433 or by using our contact form. Our Silverthorne Outlets Shuttle runs on a schedule in the Winter and runs on demand throughout the spring, summer and fall. For any visitor who would like transportation to Silverthorne, reservations can be made by either contacting us or by contacting the Outlets at Silverthorne. One of the many benefits of the Silverthorne Outlets is their proximity to the ski resorts in the area. For shuttles from Vail to Silverthorne, the ride is only 3O minutes. For shuttles from Beaver Creek to the Silverthorne Outlets, the ride is on 4O minutes. 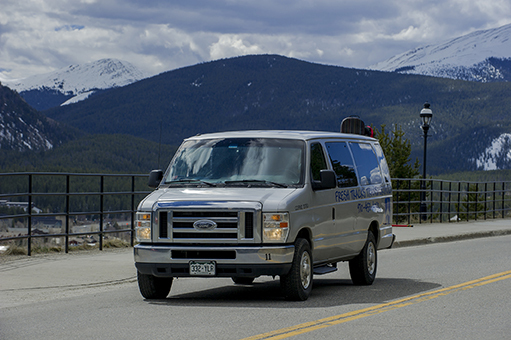 For transportation between Breckenridge and Silverthorne, it only takes 2O minutes. Copper Mountain to Silverthorne Shuttles only take 1O minutes. Keystone to Silverthorne Transportation only takes 1O minutes as well. As you can see, no matter where you are in Summit or Eagle County, the Outlets at Silverthorne are just around the corner. As for the fares, Fresh Tracks Transportation offers the guaranteed lowest Silverthorne Outlets shuttle rates in the area. Our Beaver Creek and Vail to Silverthorne Outlets rates are $4O per person round trip. Our Copper Mountain, Keystone and Breckenridge to the Outlets at Silverthorne shuttle rates are just $40 per person round trip. With those prices, you can be assured that you’ll have enough money to take advantage of all the great deals that the Silverthorne Outlets have to offer. Please contact us if you’d like to make a reservation or if you have any further questions.